In the solitaire game La Belle Lucie (which is also known as Midnight Oil, Clover Leaf, the Fan, or Alexander the Great), every move is critical. The game requires great planning and forethought and rewards the player with a healthy chance of success. One of the authors has been known to take more than 10 minutes to make a move while he plans the intricacies of competing strategies. It’s certainly not unusual for players to take a few minutes at a time to plan a move. The objective of La Belle Lucie is to build up all four suits from a foundation of the ace through to the king. You start by dealing all the cards face-up in piles of threes, making sure that each card in every trio is visible (you fan each trio so you can see a top, middle, and bottom card, hence its alias Fan). The last four cards go in two piles of two. Your aim is to move cards around the tableau to free up cards that can build up the foundation. Whenever you expose an ace on the top of a pile, you move it to start a foundation pile, and can start building the suit up from there. The next card to go on the ace is the 2 of that suit, and you keep going up to the king of the suit. If you don’t expose an ace, you have to uncover one by moving the cards around. You get three tries (or cycles) to move all the cards into suits. At the end of each cycle, you pick up all the cards off the foundations, shuffle them well, and distribute them in trios again. You can move cards in the tableau onto the card of the same suit one higher in rank, but beware! You can move each card only once, and you can only move one card at a time, which is critical. For example, as soon as the 7 of diamonds goes on the 8 of diamonds, you can’t move the 8 of diamonds again unless both cards go onto the foundation in the diamond suit. You can’t move the 7 of diamonds and 8 of diamonds onto the 9 of diamonds because of the one-card-at-a-time rule. You have thus “buried” the 8 of diamonds. You can’t move this card until the next redeal, unless the ace of diamonds through the 6 of diamonds go into the foundation, whereupon the 7 of diamonds and 8 of diamonds can also go onto the foundation. However, this rule doesn’t matter if the 8 of diamonds is at the bottom of a pile; no cards are trapped by the move. The rule does matter if the 8 of diamonds covers something else. Note that kings never move; therefore, you want them at the bottom of piles. Bear in mind that the purpose of the game is to build up all the suits in order, starting with the ace, so you try to get the aces out from their piles. If the aces are at the top of their piles already, so much the better. If not, you have to excavate them, but at the same time, you have to plan the sequence of moves that brings the cards to the top. It isn’t a good idea to play five moves to get out the ace of diamonds and then discover that the 2 of diamonds got permanently buried in the process. Of course, sometimes burying a card may prove inevitable. The skill of the game is to bury as few cards as possible by making your moves in the right order and to bury only cards that seem less relevant at the moment, such as jacks and queens. Kings automatically trap everything below them, so if you’re worried about burying the jack of diamonds by putting the 10 of diamonds on it, and the queen of diamonds is below the king of hearts, relax! You cost yourself nothing — you were never going to get to move the jack of diamonds anyway. 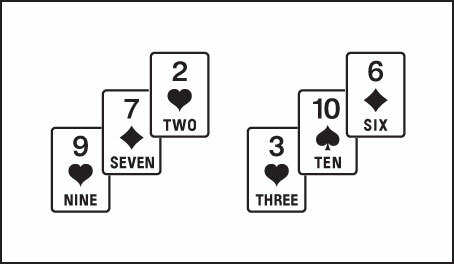 Another example of a potentially bad holding is seeing something along the lines of the queen of diamonds 10 of diamonds. Even if you get to put the 10 of diamonds on the jack, doing so freezes the jack. You can’t move the jack of diamonds again, because you can’t move the 10 of diamonds and the jack of diamonds onto the queen of diamonds. Sometimes you get mutually impossible moves, as shown here. With the base shown, you can’t move the 6 of diamonds until you clear the 2 of hearts, and you can’t move the 2 of hearts until you free the 6 of diamonds to get at the 3 of hearts. Neither card moves until the ace of hearts is free, when the 2 of hearts can go to the foundation. Only one series of moves can get you out of this mess. You can always move any queen onto the king of the same suit (because kings are stuck anyway). Whenever a card is stuck (for example, if you put the 7 of diamonds on the 8 of diamonds, you make both cards immobile), you can build more cards, such as the 6 of diamonds and 5 of diamonds, on top of it. In fact, doing so can only help your chances of getting more cards out. 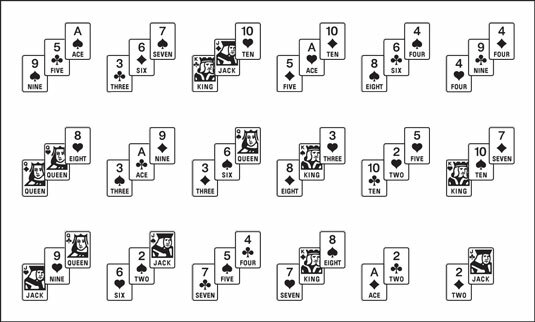 The initial layout for a sample hand appears here (the top card in each trio appears on the right). Starting a game of La Belle Lucie. The figure layout has some encouraging features: All the kings are reasonably placed (they either appear at the bottoms of their piles or at least don’t trap too many cards), and three of the aces are immediately accessible — a very fortunate combination of events. The bad news is that the jack of hearts and 9 of hearts are on top of one another, ensuring that the 10 of hearts (which traps the fourth ace) won’t move this cycle. Take off the ace of spades and start a foundation pile for spades. Put the 9 of diamonds on the 10 of diamonds (because the 10 of spades can’t move, and the jack of diamonds can’t come free, so you may as well build on the 10 of diamonds). Take off the ace of clubs, the 2 of clubs, and the ace of diamonds. The next card to go for is the 2 of spades; you can get it easily by putting the jack of spades on the queen of spades. But before you do that, can you put the queen of spades on the king of spades? To make that move, you need to put the 3 of hearts on the 4 of hearts, and to do that, you need to move the 4 of diamonds onto the 5 of diamonds. That last move is impossible, because the 5 of diamonds is trapped below the ace of hearts, so put the jack of spades on the queen of spades and take up the 2 of spades, 3 of spades, and 4 of spades. The figure shows an interesting combination of piles. Your game begins to take shape after you make the automatic moves. Put the 4 of clubs on the 5 of clubs and free the 5 of spades for the foundation. Now put the 6 of clubs on the 7 of clubs, the 7 of spades on the 8 of spades, and the 6 of diamonds on the 7 of diamonds. The 3 of diamonds is now free, which allows you to move it through the 8 of clubs onto the foundation. The preceding example shows a relatively simple problem, but the degree of interaction can get considerably more convoluted. This element of trading off one move against another is what makes La Belle Lucie such good fun. The 9 of clubs is stuck (you can’t move the 4 of diamonds), the 6 of spades is stuck, and the ace of hearts is stuck, which leaves only diamonds. The 2 of diamonds comes out easily enough by putting the J of clubs on the queen. However, the 3 of diamonds is under the queen of spades and the jack of spades, so you take the 2 of diamonds out, which ends the first cycle. You keep your foundations, but now you pick up the cards left in the tableau, shuffle them well (they were in sequence, so an imperfect shuffle can restrict your mobility), and deal them out in threes again. If you have two cards left over, make one pair; if one card is left over after you put the cards out in threes, as at the start, make two pairs out of the last four cards. You have three cycles to get out, and if you fail at the last turn, you’re allowed one cheat, or merci, by moving a single card in the tableau; whether you want to pull one card up or push one card down is up to you.